FOOD SAFETY: RAIDS CONDUCTED TO ENSURE SAFE FOOD. RAIDS CONDUCTED TO ENSURE SAFE FOOD. 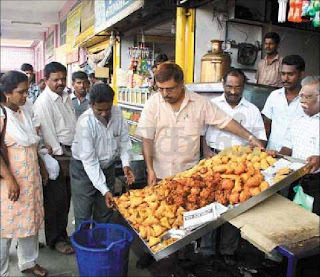 Following instructions from the Commissioner of Food Safety, Thiru.Kumar Jeyanth, I.A.S., to check the quality of cooldrinks, packaged drinking water sold in heavily crowded places during this summer season, six teams were formed in Tirunelveli district. The urban team led by Dr.Devika, Designated Officer, Food Safety Department, Tirunelveli comprising Food Safety Officers A.R.Sankaralingam, P.Kalimuthu, S.Ibrahim and M.Kalianandi, conducted their first surprise raid in the shops in and around the old bus-stand in Tirunelveli. During the raids, some food packets were found to contain post dated manufacturing dates. Food packets worth Rs.25000/- which were lacking mandatory label provisions were seized and destroyed in the presence of public that too infront of the concerned shops. The second round of surprise raids were conducted by the same urban team on 26.04.13 in the shops in the New Bus-stand, Tirunelveli. During this second phase of raid, spurious soft drinks packets, Non-ISI packaged drinking water packets, rotten fruits and snacks prepared and kept unhygienically were seized and destroyed in the presence of Public. The raids would continue to ensure safe food to the public. Please see and follow the Sec.38(1)(b) & 38(4)of the Food Safety & Standards Act,2006.